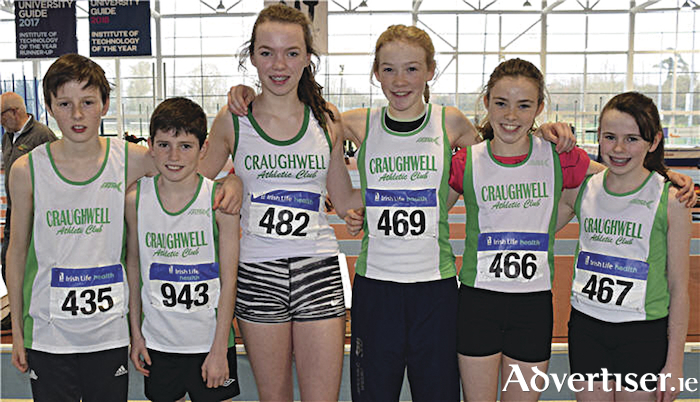 Craughwell AC juveniles at the National Indoor Combined Championships in AIT: Lukas Schukat, Cian Lavan, Ellie Cronin, Saoirse Moore, Clodagh O'Meara, and Fauve Aylmer. Margaret Higgins of Corofin was the toast of Galway last weekend at the national combined events championships in Athlone IT. Higgins won silver in the women's over 50 category at the event which showcases Ireland’s best multi-event athletes. Also producing impressive performances were Laura Cunningham of Craughwell AC, fourth in a competitive junior women’s event, while Michael Breathnach of GCH was placed 5th in the senior men’s event. Justin Lane of Tuam AC was fourth in the masters, and at juvenile level, Craughwell AC fielded a huge number of competitors, with impressive top six performances from Clodagh O'Meara, Fauve Aylmer, Lukas Schukat, Cian Lavan, Ellie Cronin, and Saoirse Moore. North Sligo AC athletes took Tuam by storm on Sunday at the 16th edition of the Tuam AC 8k road race. The club won both mens and women's sections, with Eamon McAndrew first home in 26.53. He came in ahead of clubmate Craig Brennan in second and Aidan McMoreland in third. Heather Foley was the first woman home in 30.47, with clubmate Aisling Van Rensburg second and Claire Rowe of GCH third. Shauna Bocquet of Craughwell AC won the wheelchair category. Almost 300 athletes competed in one of the longest established races on the calendar. The second round of the National Indoor League will take place in the Athlone IT Arena on Saturday with places in the final at stake. GCH men’s team lies in fourth place after the first round, with 21.5 points; Craughwell women's team is also currently fourth, while GCH women are fifth overall, following round one. The National Indoor Junior and U23 Championships will take place on Sunday in Athlone IT with many of Galway’s up-and-coming athletes competing. Among the talented athletes are Jonah Erugo And Diego Brule of GCH in the 200m, Lydia Doyle and Nicole King also of GCH over 60m and 200 and 200/400m respectively, and Sinead Treacy of Craughwell over 200m. Kilcornan, Clarenbridge, will play host to the national juvenile relays, B championships, and the intermediate and masters cross country championships on Sunday February 11. The Galway Athletics Board has secured the championships after a recent bid to host this major cross country event. In excess of 1,200 athletes will descend on the Galway venue on the day, with a large crowd of spectators expected. The sixth annual Coldwood 4 Mile takes place on Sunday January at 12 noon on a new route that is flat, fast, and AAI approved. Runners can register on Run Ireland online or on the morning of event at Coldwood School Hall from 11am. Registration cost €15 and there are cash prizes for winners. Page generated in 0.0808 seconds.